Bang Kao is the first pier on Koh Samui. 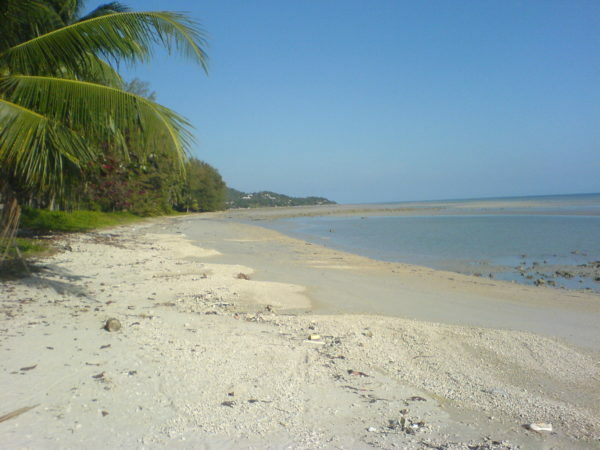 Although it is a short beach like Baan Thale, it has white powdered sand. Additionally, you can take a fishing boat to Tan and Mudsum Islands. Ban Kao south is down in the south of the island, which is home to some of the most beautiful beaches on Koh Samui, and is a good spot if you’re after the quiet life in visually pleasing surrounding. Bang Kao are amongst the least developed part of Koh Samui with only a few resorts spread at leisurely intervals along the beach on the island’s south west tip. So if you want total peace and quiet…this is it. The beach is about 2kilometers in length and fairly good for running. The sand is flat down by the water’s edge and soft and fine elsewhere, so it’s fine for rolling around with beach games and merriment at your leisure. You’ll have to stay close to the palms for shelter. It gets so hot in the afternoon. Some people prefer to deck themselves out on the sands after 5pm when it gets little cooler. It’s an isolated area, so the sands and sea are free. The waters are warm pretty much all year round, and like everywhere on Koh Samui are clear and clean so it’s great for a swim, and unlike anything residents of Europe or the US will have experienced. At the end of the day, there’s nothing better than relaxing on the beach and enjoying the sunset. The Ban Kao sunset is one of the highlights of the island. The merging of sultry colours and abundance of meteorological marvels are a sight to see every evening. There are few of older mid-range bungalow operations and a few independent restaurants but little else in the area apart from the Samui Aquarium & Tiger Zoo, which is fine as long as you don’t mind your baby tigers drugged and compliant for photo ops. A much kinder option is the nearby Butterfly Garden, which showcases indigenous varieties in a well-managed environment. One of the rare and most curious sights on the Koh Samui is located on Ban Kao. Inside the vaults of Wat Khunaram temple, open to the public for a limited period of time, are the remains of a Mummified monk, miraculously deceased over 30 years ago and yet today, preserved by the powers that be.